Rebecca (Lin) Walker, 69, of Fayetteville passed away Sunday January 13, 2019 in Cape Fear Valley Medical Center. Of Danish heritage born in England to the late John & Ivy Parkin Crosby, Lin was most proud of her Viking heritage and strong never give up spirit. She was a charming, warm caring lady who always radiated her optimism to those around her. She was a European trained Cordon Bleu chef where she catered to many events in the Sand hills region. She became a Realtor when she moved to Fayetteville in 2006 and worked in Real Estate with her life partner John Czajkowski at Modern Vision Realty Inc. She had the highest regard for service to veterans and enjoyed her many hours of volunteer work for the Sand hills Purple Heart Committee. In her free time she enjoyed gardening, visiting with first responders, shopping grocery bargains for catering events, and visiting with friends. She will be missed but forever remembered by those that knew her and were a part of her life. 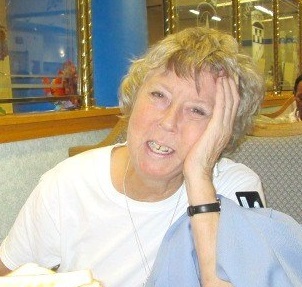 She leaves behind her life partner John Czajkowski of Fayetteville, her adopted son Andrew Youe and his wife Caroline who reside in Atlanta GA., her two daughters Mel and Kim who reside in England. Visitation will be 5:00 – 7:00 PM Friday, January 18, 2019 at LaFayette Funeral Home, 6651 Raeford Rd. Fayetteville, NC 28304. A Graveside Service will be 1:00 PM Saturday, January 19, 2019 at Cumberland Memorial Gardens, 4509 Raeford Rd. Fayetteville, NC 28304 with Rev. James Baker officiating.